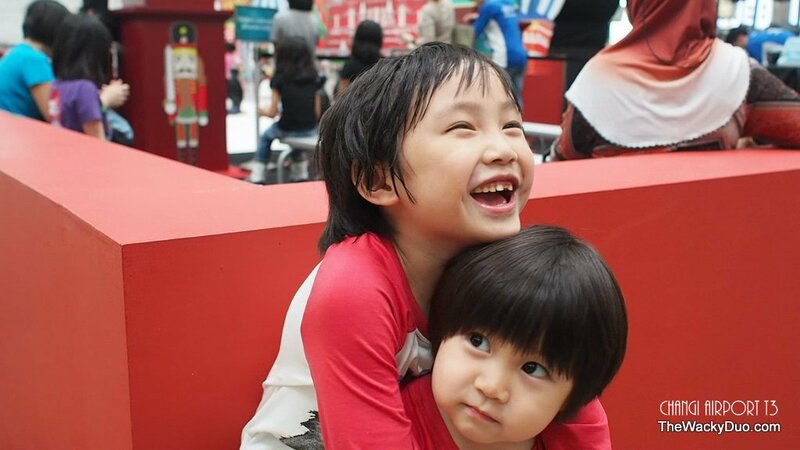 A few weeks ago , we had shared how kids can have fun at Changi airport T3. During our last visit to Changi Airport, we did not get to try the Fascinating Russia Ice skating as it was close on that day. We had express our disappointment and would most likely have miss the events as it was running for just another 2 weeks. Changi Airport had read about our 'plight' and send us an invitation to try out the ice skating. It was indeed a pleasant surprise for us. We accepted the invite. After all how many times can you experience ice skating in the airport? We are back at the Red Square on a Sunday afternoon to try our skates. The VIP passes allow us to have unlimited skating for the day. A real treat from the good people of Changi Airport. We put on our ice skates and am ready for my first ice skating experience. Since the ice skating was only open to kids age 5 and above, Daddy will be my partner in crime for this activity. It was his first ice skating experience as well. Daddy can roller blade, but can he ice skate? In any case, there are a bunch of penguins who are there to guide us should we fall. I was all ready and eager to try out the ice skating. We decided since we were both first timers, we would take a penguin with us along with us. Daddy was glad that we did as he soon found out that ice skating is alot harder than rollerblading. In the first few minutes, I was still trying to find my feet on the ice. There was a few falls and bumps but surprisingly that did not deter me from having my fun. In fact I was enjoying every little fall and kept practising on falling and getting up. Just like life, we need to fail in order to learn. It is not the failure but the ability to bounce back that makes us succeed. Daddy is proud of me, regardless of the fall, I am determine to master the art of ice skating by one session. Soon I decided to dtich both my dates, Daddy and the penguin. I even managed to shock little brother when I decided it is time to venture our on my own. First it was a trip around the circumference of the rink using the rails. Before you know it, I am out on my own! During the ice skating session, Daddy noticed that the majority of kids are able to at least walk on their own after a while. Compared to the adults, the kids seem to have a natural ability to blade. I think he had underestimate the abilities of what kids can do nowadays. Mommy saw that I was having so much fun that she decided to join me. Sorry Daddy, I think Mommy is a better ice skater than you. She is able to glide through the ring like a butterfly and keep up with me. It may be my first time ice skating, but it was definitely a blast... er Daddy can we stay here a little longer? After a whopping 2 hours, my little legs decided to take a break. Can I bring this home? Seeing how I managed to suceed in ice skating on the first day, Daddy decided that he might get me a pair of roller blades so I can blade with him .. Yipee! Here is a little thank you video for Changi Airport. Thanks Changi Airport for the invite!It was another great 6 hours spend on a lazy Sunday afternoon at Changi Airport. The Fascinating Russia may have ended, but we are sure Changi Airport will bring us to a new destination in time to come. Watch this space! DisclosureThe Wacky Duo were invited for a complimentary unlimited ice skating session. No monetary compensation is given. All documentation of falls and bumps are of our own.